Smart business automation solutions – your way. Lifetronic Systems cannot control the outcome of company meetings, but we can control the electronics. We understand that technology snafus have no place in the boardroom. Pressing a button marked “Presentation” and the lights dim, the shades come down, the projector turns on and a screen unrolls for life-like video presentations. There are speakers above every seat, so even the company’s soft voices are easily heard. There are inputs for PC and Apple computers. You can even run your presentation wirelessly from an iPad. 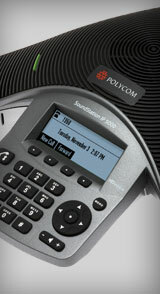 A high-tech phone system makes audio-conferencing crystal clear. Pressing the “Away” button puts the room – and all the equipment – to sleep. You’re in control. The possibilities are endless. Business & Corporate Automation Service Areas: Lifetronic Systems is located in Westport, CT, and services all of Fairfield County, CT, and Westchester County, NY, including: Westport, Wilton, Weston, Redding, Easton, Fairfield, New Canaan, Darien, Greenwich and beyond. We also travel beyond Connecticut and New York upon request.